You can drop ship a new Canon ST-E2 to me, or send me your ST-E2 for any of these mods. The mod fees shown do not include the ST-E2 unit, naturally. 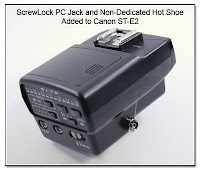 Here the ScrewLock PC Jack and a Non-Dedicated Hot Shoe has been added to the Canon ST-E2 unit. 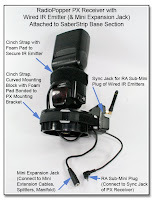 The Non-Dedicated Hot Shoe Mod is $80, while the Aux Sync Jack with the standard sub-mini jack (see below)is $70. 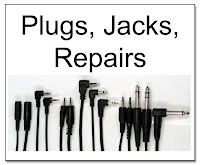 Because it is so hard to find, and expensive a part, it is an extra $40 to use the ScrewLock PC jack instead of the sub-mini jack as seen in this image. 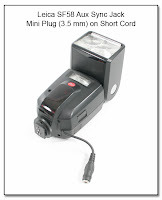 The non-dedicated hot shoe can be used to fire a PW, or a manual flash. 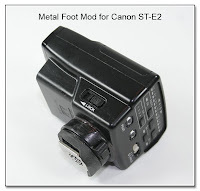 The Metal Foot Mod for ST-E2 controller unit is for those photogs who want a metal to metal contact for their equipment. 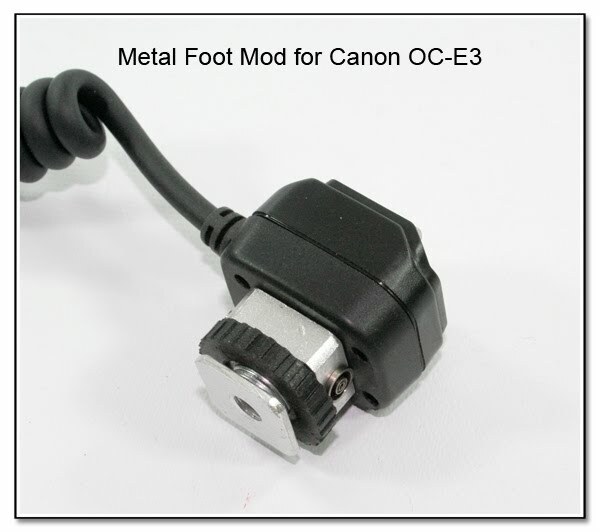 This is the same metal foot assembly as is on the 580EX II flash unit, the new OC-E3 Off Camera Cord, and my Metal Foot Mod for the 580EX flash unit. More of the ST-E2 needs to be taken apart and reconstructed than in the 580EX Mod. 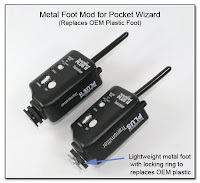 This style of the Metal Foot Mod is no longer being done, and has been replaced by the Hi-Strength Metal Foot Mod seen below. The Metal Foot Mod now has a larger bearing surface where it is attached to the ST-E2, and it is connected using 4 machine bolts and nuts, as well as an epoxy bond. This does increase the overall height by about 3/8 inch, but the overall strength is much higher than the previous metal foot mod. This mod is quite labor intensive, and will cost $155. 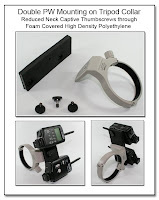 The rubber gasket is included with this mod. The composite image also shows some other mods that were done for this specific photog: IR Shutoff Switch ($60), and the Special Dedicated Hot Shoe which has been relocated to the battery door, to be more centered over the camera hot shoe for a better general balance. Adding the Dedicated Hot Shoe in this location is $195. 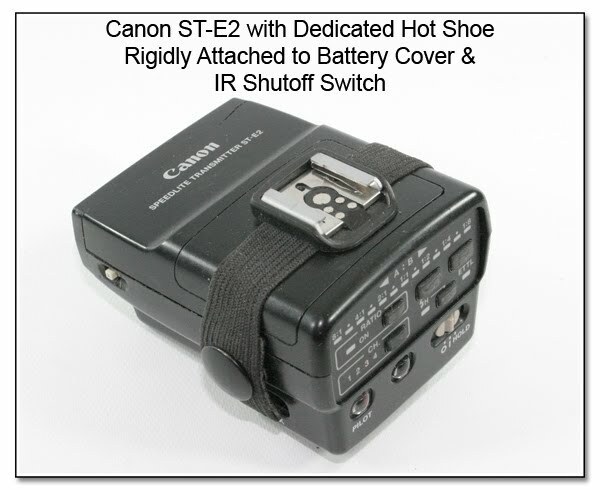 This ST-E2 also is equipped with the Dedicated Hot Shoe and the IR Shutoff Switch, but the Dedicated Hot Shoe is rigidly attached to the battery door cover as a way to get the load more directly over the camera hot shoe. The snap on strap helps to support the load in the Dedicated Hot Shoe, since the battery door does not have a very secure latch, as when a flash unit is sitting in the Dedicated Hot Shoe (image below). 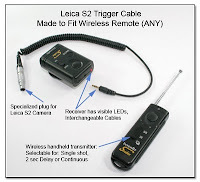 This is a perfect way to get a second AF Assist Unit when shooting in very dim light. 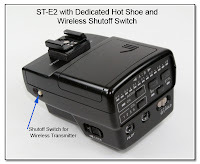 In this specific mod, this ST-E2 also has the IR Shutoff Swtich, as a way to disconnect the wireless component of the ST-E2, and save battery power when the unit is being used strictly as a focus assist unit. 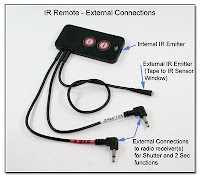 The IR Shutoff Switch Mod is $75. 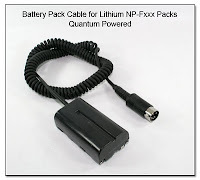 Adding the Dedicated Hot Shoe in this position is $185, as the multi-conductor flat cable needs to be carefully snaked around and over the battery pack. 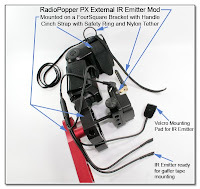 Here is an OC-E3 with the Dedicated HotShoe & Aux Sync Jack. 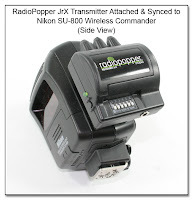 To trigger a manual flash, radio transmitter, or a second eTTL flash, the added Dedicated Hot Shoe has been done many times, and works well, depending on the flash and camera combination. As is now well known and reported, trying to trigger a radio transmitter when using a 580EX II flash along with one of the newer Canon cameras (40D, 5D Mark II, 1D Mark III, etc), there exists a digital pulse communication signal superimposed onto the center pin trigger contact, and this interferes with the trigger for the radio transmitter. 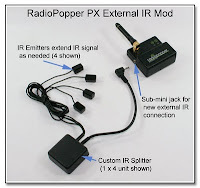 None of the current radio triggers have the circuitry to filter out this digital pulse, and the simplest workaround is to connect the radio transmitter to the camera PC sync jack. 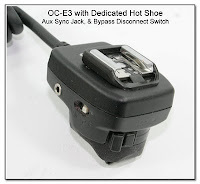 This OC-E3 has a Special Aux Sync Jack & Bypass Disconnect Switch. 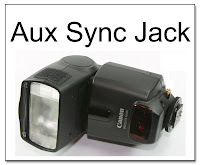 As is usually the case, the Aux Sync Jack connects to the center (pos) and rail (neg) contacts, but when a plug is inserted into this Aux Sync Jack, the attached hot shoe is disconnected from the camera hot shoe, and is only connected to the sync cord plugged into the Aux Sync Jack. 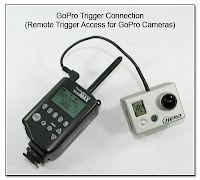 This allows the sync cord to be plugged into the camera PC jack, and then the dedicated hot shoe will get triggered through the camera PC jack, while the tail of the OC-E3 will be triggered by the camera hot shoe. 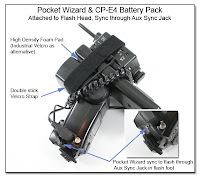 When the Bypass Disconnect Switch is ON (forward position), the attached hot shoe is reconnected back to the camera hot shoe on the bottom of the OC-E3, and the AuxSync Jack acts just like all the other Aux Sync Jacks thoughout this site. 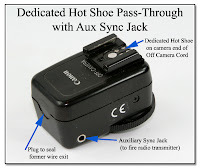 The Dedicated Hot Shoe costs $130, while the Special Aux Sync Jack costs $80, and the ByPass Disconnect Switch will cost $75. These mods can be done starting with a new Canon OC-E3 for $85, a new generic OC-E3 for $50, or any OC-E3 that you send me. 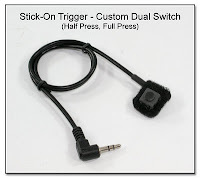 This mod can be made using the existing 1 meter cord, or the longer replacement cords of 3, 5, or 10 meters, as well as using the straight cords, fixed or extendable. 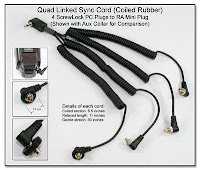 The Sync Cord shown (above) is a special coiled version available for all of the Aux Sync Jacks (2.5mm, sub-mini size) throughout this site, and ends in the ScrewLock PC plug. 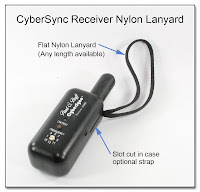 This high quality sync cord is priced at $40, and can be fitted with the optional Aux Collar (shown inset) for an extra $25 to make it easier to turn the locking collar. 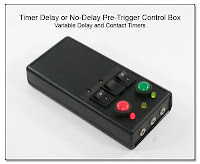 The A-B-AB Selector Switch can be added to many items where it is desirable to fire either 1 or 2 Canon EX flash units or other devices. 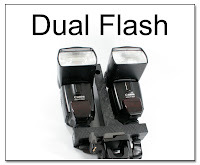 While it is possible to fire 2 EX flash units in eTTL mode on a linked OCC, if you only want a single flash unit to fire, previously you had to physically remove the flash unit from the hot shoe (not just power the unit to OFF), or the other flash unit would switch into TTL mode and put out the wrong power level. 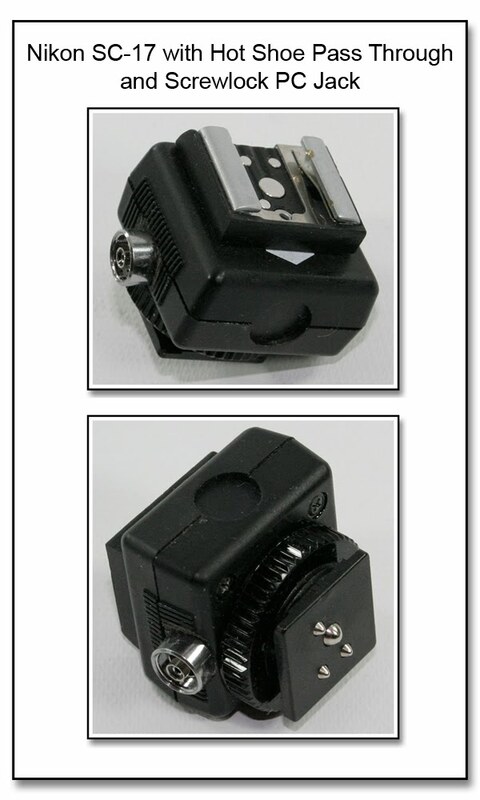 This slide switch will allow either a single flash or both flash units to be fired correctly in eTTL mode, as long as each flash is still powered to ON when physically sitting in the hot shoe. The slide switch is set so it is within easy reach of your left hand, and is easier to switch than physically removing one flash unit. 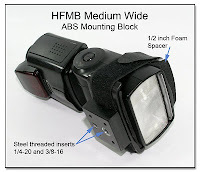 This A-B-AB Selector Switch Mod was first developed for the Custom Modded 580EX II - Zero Height OCC, where the OC-E3 mini-DIN connection and the A-B-AB Selector Switch were built into the flash unit itself, so that the flash would not be sitting any higher in the camera hot shoe. To add this A-B-AB Selector Switch into the camera end of the OC-E3 is $120, and it is an additional $130 to add the dedicated hot as seen here. 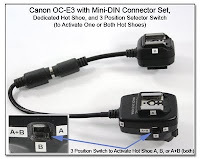 The mini-DIN connector set, either the male/female set as in the first image, or the dual female set as in the second image, is $80. The OC-E3 itself is not included in these prices, and you can use a Canon branded OC-E3 which is $85, or a generic look alike to the OC-E3 which is $50. You can also send me your own OC-E3 for any of these mods as well. 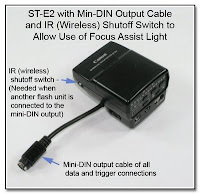 Here is the 2x mini-DIN Splitter that can be used to easily split the data lines as you might expect to go to 2 flash ends as in the next image below. 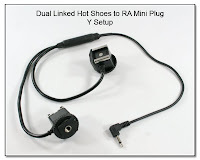 The 2x mini-DIN Splitter is $140 as shown, but can also be made with an Aux Sync Jack and Hot Shoe if needed, and is seen here for $260. 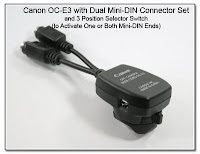 The individual Flash End with mini-DIN Connector(using the OCC-2 components shown) is $95, while it is $110 using the newer OC-E3 component as seen here (item #2). Adding the Long Screw and Epoxy Reinforcement (just below) to the Flash end will greatly reinforce the strength of the connection point, but does add $70 to the cost. In this 2x Mini-DIN Splitter, a 3 position slide switch can be seen in the junction box. 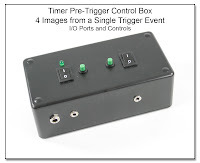 This switch will select how the return to camera eTTL signals are routed, either from leg A, leg B, or from both legs A+B. 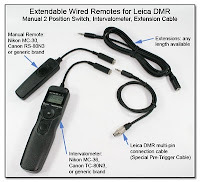 This setup will allow MULTIPLE Canon EX flash units that are NOT identically matched to operate together in eTTL mode, as long as they are hardwired back to the camera via a cable. 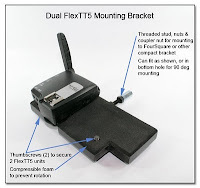 The PW FlexTT5 is NOT a hardwired device...this will not currently work with the PW FlexTT5. 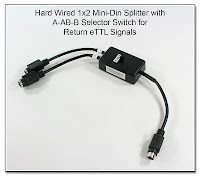 The 2x mini-DIN Splitter is $140 as above, and the 3 position slide switch (A-AB-B) will add $120 to this cost, for a total of $260. 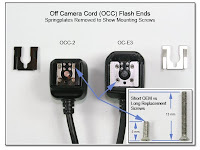 You can also have a second slide switch like is seen in OC1010 (above) to select which flash is actually fired without having to physically remove one flash from the cord set. 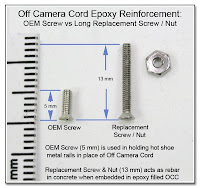 OCC Screw Comparison: The 5mm short screw is what is used by manufacturers to hold the metal rails of the hot shoe to the rest of the housing. 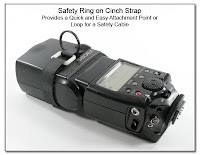 If you find a constant loosening of the metal hot shoe rails, then you need the short screws replaced with longer 13 mm stainless steel screws, and secured with nuts locked into place. 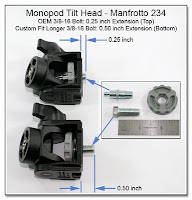 These longer screws and nuts are how all the extra dedicated and non-dedicated hot shoes are attached throughout all the OCC mods on this site. To get access to the mounting screws, the metal springplate must be removed, as seen in the next image (below), and then the short screws are swapped out for longer screws and nuts; this part of the mod is $35. As a second and separate part of the Epoxy Reinforcing Mod (done only after the longer screws and nuts are in place), Reinforced Epoxy is used. Epoxy resin is injected under pressure through an access port to fill the entire housing, eliminating any air spaces, and capturing the long screws in a similar fashion to using rebar in poured concrete. It is $35 for the epoxy fill, and again, the longer screws do need to be replaced first as just above. 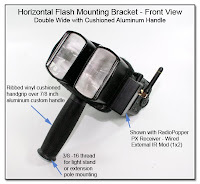 It is still possible to break the foot plate, or break one of the small wires in the cable, and then any subsequent repair naturally becomes more difficult and costly, usually needing to replace the entire flash end assembly. 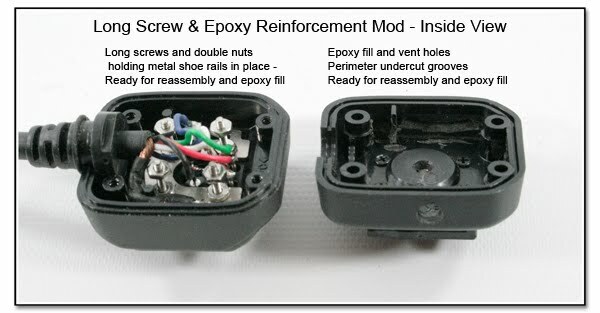 The Long Screw & Epoxy Reinforcement Mod is started by replacing the factory short screws seen in the image above with the longer screws and double nuts. The other section of the housing gets a fill hole, and a vent hole, as well as undercut epoxy capture grooves around the inside perimeter. The housing is reassembled, and epoxy is injected through the fill hole to solidly encase the long screws, nuts, wires, and undercut capture grooves. 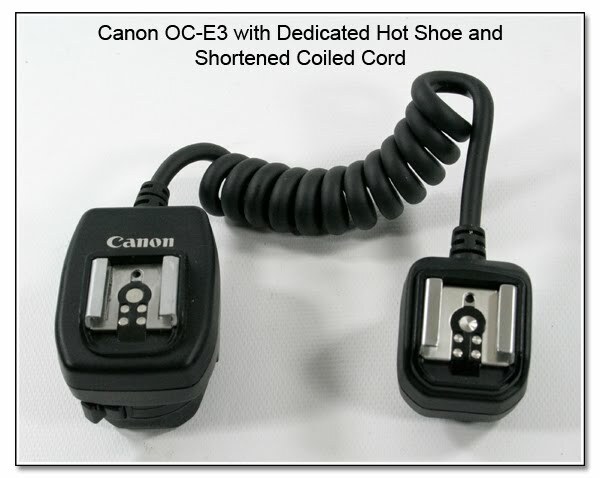 The OC-E3 with Dedicated Hot Shoe has no other mods shown, although Aux Sync Jacks, extended coiled or straight cord are optional as seen in the other examples on this page. The pricing as shown is $85 (OC-E3) + $130 (ded hot shoe labor) + $30 (ded hot shoe) = $245, and will allow 2 flash units to operate in eTTL mode, or the hot shoe can be used to mount a radio transmitter, or the shoe can be used as a parking spot for the flash end of the OC-E3 when your left hand gets tired from holding the free end mounted flash unit. This and all OCC mods can be done own an OCC you send to me or one I supply. 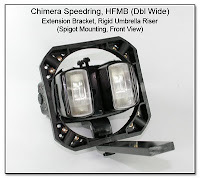 If you want the coiled section shortened between the camera and flash end, as in this image left, this is an additional $60, and you need to specify the relaxed distance, or number of coils you want to remain. Should you want the cord shortened into both ends as a way of reducing the straight tail lengths, this means each end needs to be opened and resoldered, and is double the $60 mod fee. This OC-E3 w/ Dedicated Hot Shoe is the FlashZebra brand (item # 0122), and you can see that the coiled section is only 6 inches long (30 coils), and has the short straight tail sections. 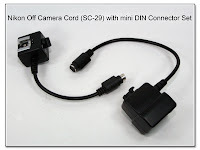 This cord is great for the Dual Flash setups where the flash units are close together. Using this cord, you can usually skip having to shorten the OC-E3 cord, saving you some dollars. 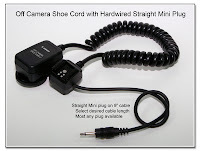 You can order this cord directly from FlashZebra and have it drop shipped to me, or I can supply it as I now usually keep a couple of these cords on hand just for these mods. 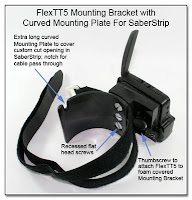 atop Camera End) is used to both mount the FlexTT5, connect to flash #1, and provide a connection point into flash #2. This OC-E3 mod involves adding a dedicated hot shoe onto the top of the OC-E3 and costs $130 (not including the 2 needed OC-E3 cords). (The second OC-E3 cord is used for the extra dedicated hot shoe itself that is then added to the first OC-E3.) The OC-E3 shown here has also been shortened ($60), but that is not necessary for this dual HSS operation. 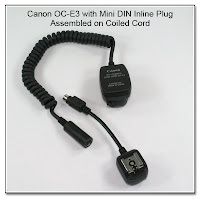 The Mini-DIN Connector Set for the Canon OC-E3 is shown in items #1) and #2), while item #3) is called the "Flash End Mini-DIN Pass Through Splitter". 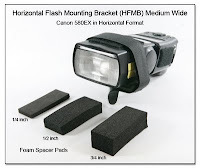 Two Canon EX flash units can work together in eTTL mode using these sections, spaced anywhere by using mini-DIN extension cables between the connection points. 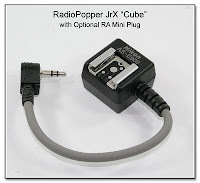 The OC-E3 is priced at $85, and the mini-DIN connector set (replacing the coiled cord) is $80. These two items are very often used without the Pass Through (#3), just as a way to extend the OCC to any length needed. 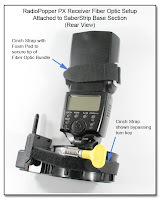 Add a hot shoe to the top of the camera end, and you have a place for an additional flash or radio transmitter. 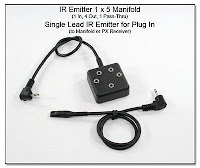 The "Flash End Mini-DIN Pass Through Splitter" (#3) is $165, and has the two mini-DIN leads as input and output. 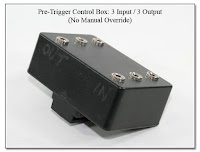 (The same "Pass Through Splitter" is $150 when the older OCC-2 component is used, seen here.) 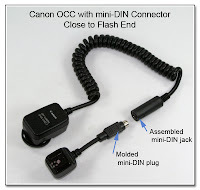 To get just the Flash End with mini-DIN Connector (#2) is $110 as shown ($95 using the older OCC-2 component as shown here.) 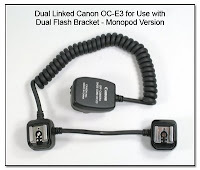 Using the two flash ends, two Canon EX flash units can be used together as in a softbox, both in eTTL mode, with only a single cable going back to the camera. Mini-DIN extension cables are available in a variety of lengths: 6' $30, 10' $33, 15' $35, 20' $38, 25' $40, 50' $65, 100' $85. 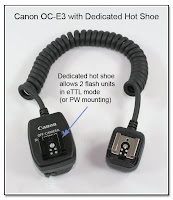 Activate One or Both Hot Shoes) can be optionally added to the camera end of the OC-E3 to enable the firing of just one or two Canon EX flash units sitting in the hot shoes, all the while in eTTL mode. If you leave an EX flash unit in each dedicated hot shoe, they both must be powered ON, and the wireless component must be OFF. 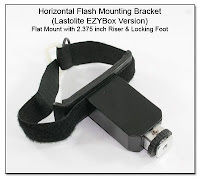 If you try to power one of the units to OFF while still in the dedicated hot shoe, the remaining flash unit will switch from eTTL mode to TTL mode. The A-B-AB Selector Switch solves this problem. 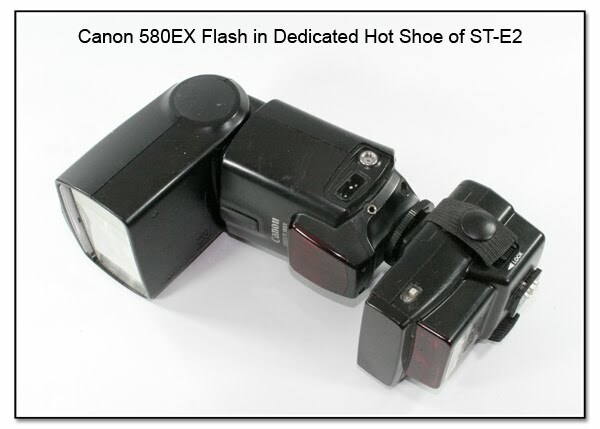 Activate One or Both Hot Shoes), which will allow either one or both of the Canon EX flash units to be fired without having to physically remove one unit from the hot shoe in order to prevent it from firing. The image above shows a cable of 12 coils, but any length and cable exit direction is available based on your needs, just ask! This and all OCC mods can be done on an OCC you send to me or one I supply. 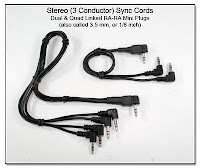 If you use one of the generic OC-E3 cords, the starting OC-E3 cord will just cost $50 (as opposed to the $85 listed above), but they are made with a much longer straight tail section of about 6 inches on each side of the coiled section. To shorten the second tail section would be an additional $60 if you want it to look like the image with a short straight tail on either side of the coiled section. These mods can be made on a new Off Camera Cord (for the $60 while they are still available), or an OCC you send in to me. 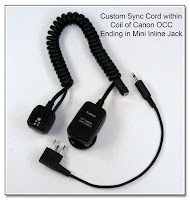 One Standard Sync Cord is included with the Aux Sync Jack Mod. A popular substitute or additional backup sync cord is the 6 foot Coiled Sync Cable which is $20 as a substitute to the Standard Sync Cord, or $35 as an additional backup cord. 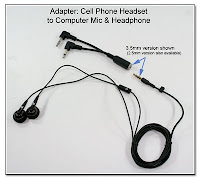 This cord can can also be extended using either the Hardwired Extension Cable, or using the mini-DIN Connector set and mini-DIN Extension Cables. 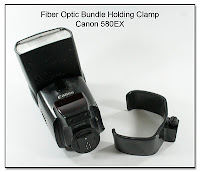 The A-B-AB Selector Switch can be optionally added to the camera end of the OC-E3 to enable the firing of just one or two Canon EX flash units sitting in the hot shoes, all the while in eTTL mode. If you leave an EX flash unit in each dedicated hot shoe, they both must be powered ON, and the wireless component must be OFF. 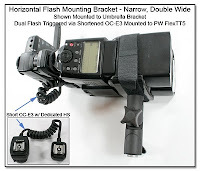 If you try to power one of the units to OFF while still in the dedicated hot shoe, the remaining flash unit will switch from eTTL mode to TTL mode. The A-B-AB Selector Switch solves this problem. 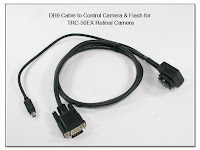 This Pass-Thru connector can serve several purposes. 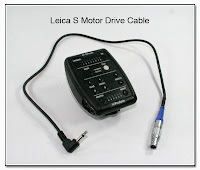 It is a specialized version of the Off Camera Cord w/ Dedicated Hot Shoe and Aux Sync Jack in that there is no extension cord. 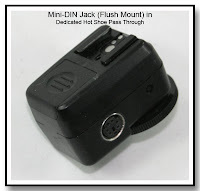 A flash unit sitting in the upper dedicated hot shoe will be elevated from the camera by just over an inch, and the Aux Sync Jack will provide access to the X-sync contacts which is especially useful for those flash units that don't have this provision. front), or both can go on the same side. 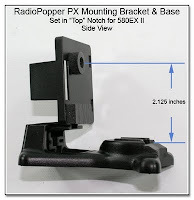 Adding the Mini-DIN Flush Mount Jack to an item like this will generally cost $70, and as can be seen in other items in this section, the Aux Sync Jack is also $70. When both the Mini-DIN Jack and the Aux Sync Jack are being added to the same unit, the cost will be only $110, for a savings of $30. 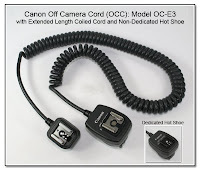 As with the Dedicated Hot Shoe OCC above, these mods can be made on a new Off Camera Cord (for the $60 while they are still available), or an OCC you send in to me. 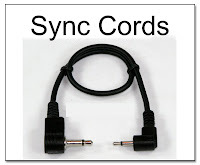 One Standard Sync Cord is included with the Aux Sync Jack Mod. A popular substitute or additional backup sync cord is the 6 foot Coiled Sync Cable which is $20 as a substitute to the Standard Sync Cord, or $35 as an additional backup cord. Note: The Canon branded OEM version of this OC-E3 will look the same, except that it has the work "Canon" on the cover. The screws all have a finer thread than the generic version, and the pricing is the same as above, except that the cost of the OEM version of the OC-E3 itself is $85, so in the example here, the total is $85 + $60 + $50 = $195 (as compared to the $160 using the generic version). 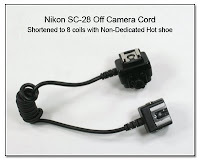 The Dedicated Hot Shoe is reduced to a minimum thickness, and attached to the upper surface of the camera end of the SC-17, as you can see in the Nikon Dedicated Hot Shoe Pass Through Device. The front cable opening has been closed off, and a Screwlock PC jack is added to the right side of the unit. 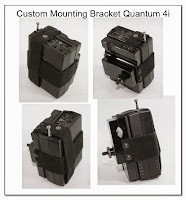 This unit is priced as above (OC1033), but then the Screwlock PC Jack will add $40, closing the front opening is $25, and the epoxy reinforcing along with the thin height of the upper hot shoe will add $65. The Mini Height Canon OCC is shown constructed using flat ribbon cable, but for longer lengths, a PVC covered round cable is usually best. 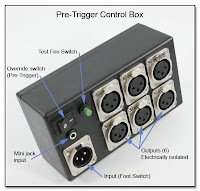 A Mini-DIN or rectangular multi-pin disconnect can be used to allow one end to fit through a narrow pass through opening. 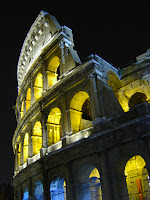 While the image shows the Canon version, the same completed item can be made in the Nikon format for the same costs. More information coming soon (or ask)! 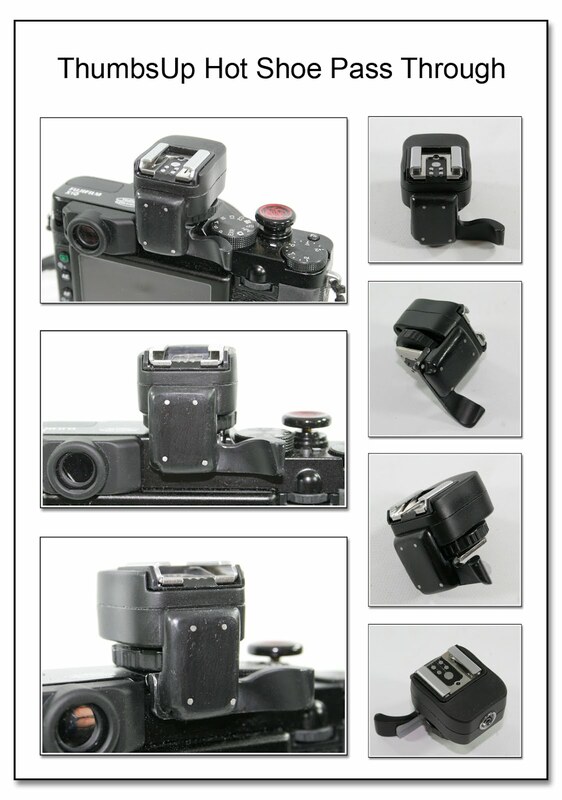 The Thumbs Up device provides a very good thumb rest to stabilize the camera (Fuji, and Leica models), but it takes up the camera hot shoe, and currently has no contact pass through provisions. The Thumbs Up unit seen here was modified by cutting off the horizontal plate that usually fits into the camera hot shoe. An offset reinforcing plate was then fabricated to attach the Thumbs Up to the Hot Shoe Pass Through Device, maintaining the correct orientation of the separate pieces. The composite image (left) shows several different views of the Pass Through device, and the combined unit sitting in the hot shoe of a Fuji X10 camera. 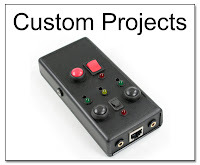 This is a very labor intensive mod, and does require you to send along both the camera and Thumbs Up device for the modification to assure a proper fit. The fee is $245, which includes the Hot Shoe Pass though component, but not the Thumbs Up device you must send me. 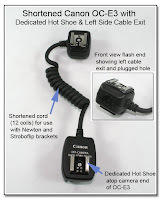 Here is a Low Profile SC-17 with Attached Hot Shoe. 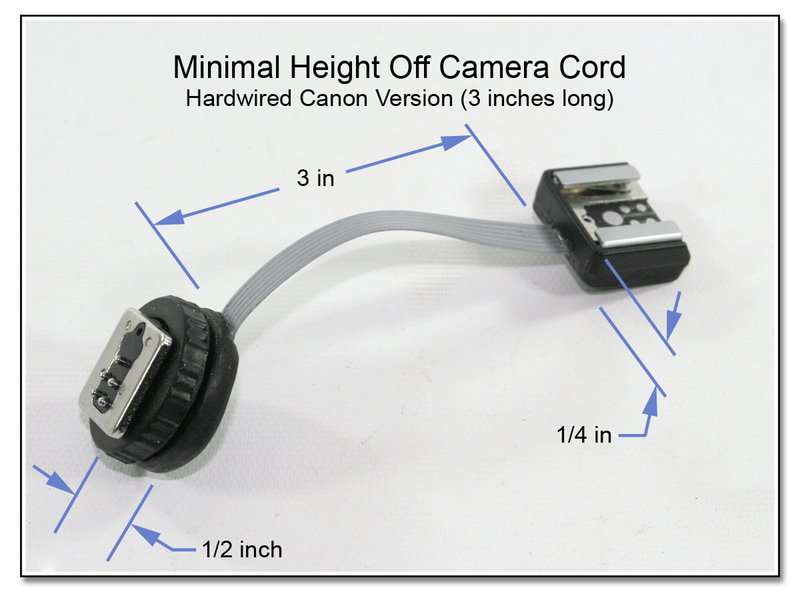 You can see that the normal height of the camera end of the Nikon SC-17 Off Camera Cord is 0.98 inches, while in comparison, the minimum reduced height is 0.58 inches. 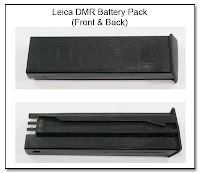 This is especially useful for those Leica owners to allow both an external finder and an off camera flash to work together. 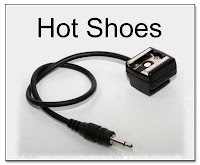 Putting a non-dedicated hot shoe (X-contact only), seen in image below, on top increases this height by 0.1 inch for a total height of 0.68 inches. A plain cold mounting shoe can be attached to the top which would only add 0.05 inches for a total height of 0.63 inches. 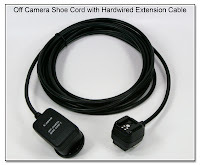 In this other view of the camera end of the SC-17, you can see the standard coiled cord has been replaced with a mini-DIN connector, which would allow any length of mini-DIN extension cords (6' $30, 10' $33, 15' $35, 25' $40) to be put between the two ends of the SC-17 OCC. 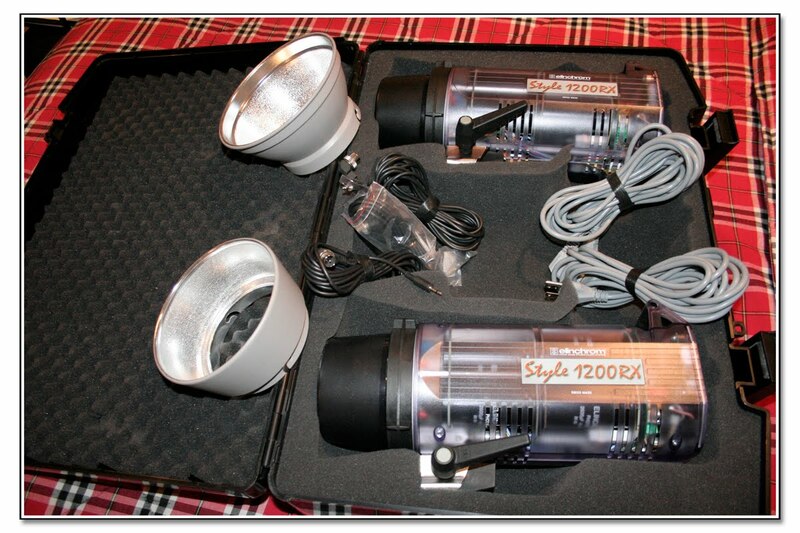 To mod the SC-17 from the normal height to the Low Profile height is $75 in addition to the SC-17 cord itself. Like all my OCC mods, you can supply the SC-17, or I can, although it is a discontinued item, and only used versions are available, but they are usually $60 for the OCC. 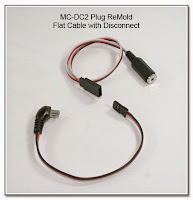 It is $80 to replace the coiled cord with the mini-DIN connector set (This mini DIN connection must be done to get the smallest height possible as the existing coiled cord it much thicker than the mini-DIN cord). To add the non-dedicated hot shoe to the top of the Low Profile SC-17 is $80, while adding just a plain cold mounting shoe is $50. (You could also skip the cold shoe, and have this Low Profile SC-17 attached directly to the bottom of an external finder, if desired.) 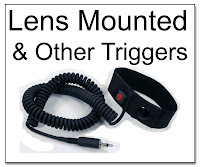 For another item often used for the Leica camera is my custom Low Profile Hot Shoe Pickup seen in this link. 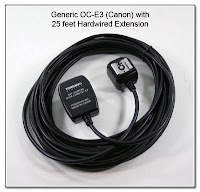 Click on the image to review the directions on how to measure and mark your OCC (Canon, Nikon, or other), for shortening so it fits your needs when used with a specialized camera bracket. It is $60 to shorten your cord to your specs. 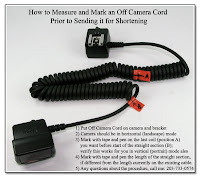 The cord will not be cut and spliced at the points marked as A & B in the image, but these markers will be used to determine how much cord to pull back inside the camera end of the OCC. 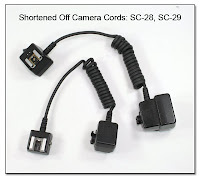 Here are examples of both the SC-28 and the SC-29 OCC's (Off Camera Cord's) having been shortened to a relaxed length of just 8 inches. 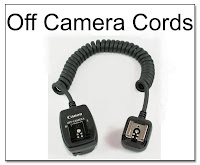 The cord was pulled into the camera end, as in the above instructions. This mod is $60. 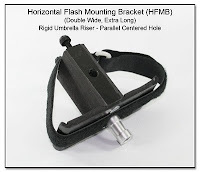 If you wish to have the cord pulled into the flash end also, so that the 5 inch straight tail is smaller, this would add another $60 since it is actually a second mod on the same cord. Here the the SC-28 shortened to just 8 coils, but a non-dedicated hot shoe has been added to the top of the camera end. 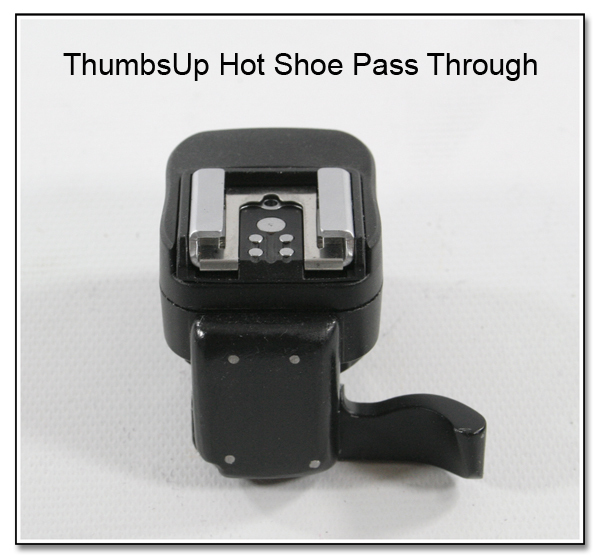 This hot shoe can trigger a radio transmitter, or a manual flash unit. 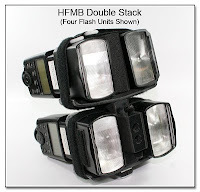 This flash unit can be any brand of flash, but it will only fire in a manual mode, and then can be used as a bounce flash to add dramatic light to the overall scene. The mod to shorten the SC-28 is $60, and the non-dedicated hot shoe addition is $80, and as all of these mods, it is best done on a SC-28 you send me, or I can supply a new one for $75. A new SC-29 cord I supply would be $90. 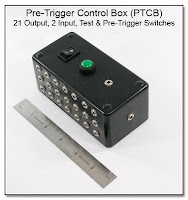 The OCC 2x Signal Splitter is a custom item that can be configured in different ways. 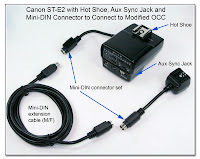 When used with the OCC with the mini-DIN connectors, this 2x Splitter can allow multiple connection points using mini-DIN extensions in various lengths. 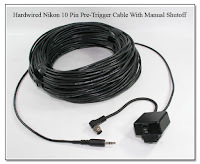 The 2x Splitter in a plain junction box without the hot shoe or sync ports is $140. 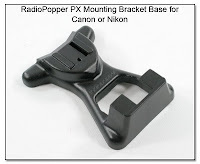 As shown with the hot shoe, sync ports, and mounting foot is $260. 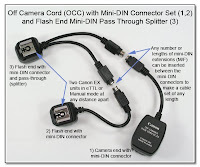 This OCC 2x Splitter Connection Image shows how the 2x Splitter (above)can be connected in between the camera and extension (flash) ends of the OCC. 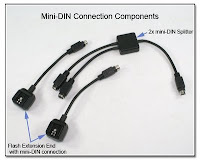 Normally, mini-DIN extensions in various lengths are used to extend the separation between the components. 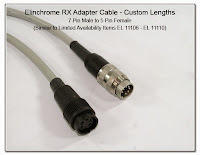 The 2x Splitter as shown (#2) is $260. 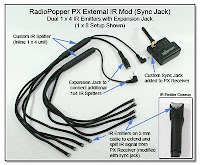 The Extension end with Pass-Thru (#3) is actually a mini-DIN splitter built into the extension end and is $150, while the extension end ending in the min-DIN connector (#4) is $95 without the aux sync jack, and $165 including the aux sync jack. These components are shown using the OCC-2 flash end, while using the OC-E3 flash end would add $15 to the costs. 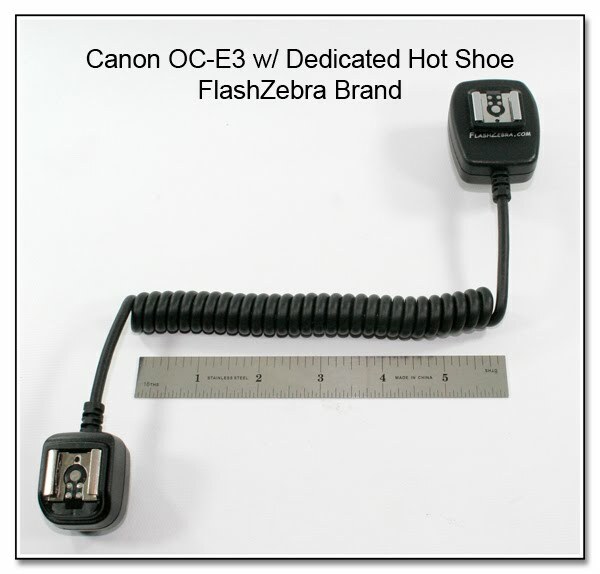 The Dual Linked Canon OC-E3 Off Camera Cord (straight section) will cost an additional $40 to heat treat and uncoil the cable between the 2 flash sections. To have the cable exit the sides of the flash ends (shown), as opposed to the usual front of the flash end, will cost an additional $25. 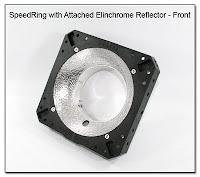 It is also very popular to reinforce and strengthen the flash end of this OC-E3, as it is often times subjected to extreme forces, as can be seen in the OCC Screw Comparison - Epoxy Reinforcement. 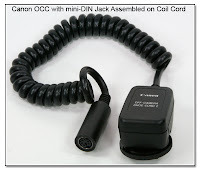 This image shows the difference between the "Daisey-Chain" configuration, and the "Star" configuration of the Dual Linked OC-E3 Off Camera Cord. Each of these cords currently cost $130 plus the cost of 2 OC-E3 cords that you send me, or I supply. 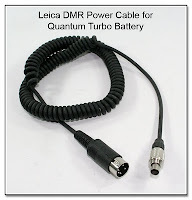 rubber coiled cable that stretches 6 to 8 feet ($60 + $40 cable cost). 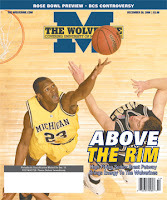 More information and pictures can be seen in the sections on Off Camera Cords. 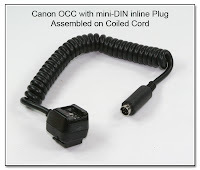 Here is an example of a Customized Application of an OCC where the molded inline mini jack is hardwired to come out of the front of the OCC, parallel to the coiled cable, and is threaded through the coil itself. 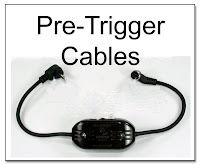 The customer supplied 3 prong HH to PC plug sync cord was then modified to the proper length, and mini plug connector was added. 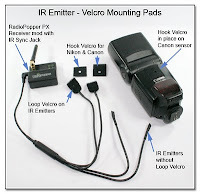 These modifications total $80 and do not include either the Off Camera Cord or the HH cord. Make sure to read the important notes just below when using the 580EX II or the 430EX II along with one of the "newer" digital signal cameras. Here is the Metal Foot Assembly shown attached to a Stroboframe Type of cold shoe in both the unlocked, and locked positions. The "Stroboframe cold shoe" has angled edges of the rails that put a downward component of the clamping force when the movable rail is tightened against the foot of the Metal Foot Assenbly. This combination of inward and downward forces will tend to put extra stress on a plastic foot plate, and will likely cause early failure of the plastic. This is much less likely with a rigid metal foot plate like what is on the Metal Foot Assembly. Before placing the Metal Foot Assembly in the Stroboframe Cold Shoe, you should thread the lock ring to the most upper position (fully unlocked). Place the Metal Foot Assembly in the Stroboframe Cold Shoe, and tighten the Stroboframe locking rail until it is just SNUG (not tight). Then tighten the lock ring of the Metal Foot Assembly until it is pressing against the top of the Stroboframe Cold Shoe, exerting an upward force on the Metal Foot Assembly, and counteracting the downward forces of the Stroboframe Cold Shoe. 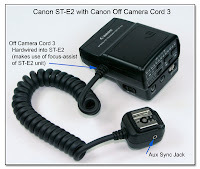 Most options are available for both the Canon and Nikon Cords. 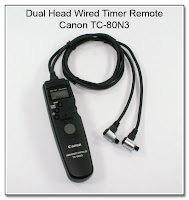 IMPORTANT NOTE (11-18-07): When the 580EX II flash is used with the Canon Mark III, and as of 6-18-08 also the 40D, the Aux Sync Jack (or attached hot shoe) will NOT output a signal to fire a radio transmitter, even if this mod is done due to a pulsed signal in the communication between the 580EX II and these cameras. 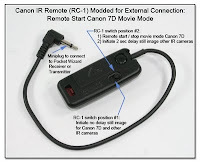 Doing the mod will, however, allow the flash to output a signal to fire a transmitter with all the other Canon bodies, and will also allow an input signal from a radio receiver in all 6 of the operational modes, regardless which Canon body is being used.The current workaround here would be to connect the radio transmitter directly to the camera PC jack, instead of the 580EX II, or use the 580EX II flash as the off camera flash, and use a different flash for the on camera fill unit. 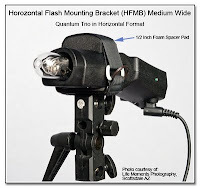 The PW can be mounted either to the flash head (PW Caddy), or even to the camera bottom using the Modified Tripod Quick Release Setup, shown here. 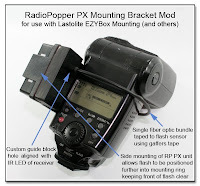 The Dual Dedicated Hot Shoe setups will allow 2 EX flash units to operate correctly in eTTL mode, as long as both are powered on, and the wireless component is set to OFF (not Master, nor Slave). 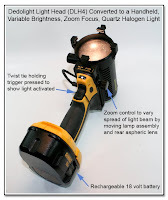 This has been used successfully many times in many different forms, as seen thoughout this section, and in the Dual Flash Section. This is primarily used to provide additional light output over using just a single unit, and thereby also reducing the flash recycle time of each unit. 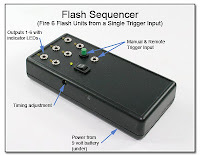 What does not seem to work is to have one flash unit being used as a bounce, while the other unit is pointing straight ahead. 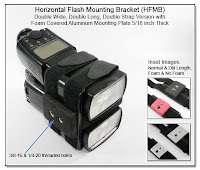 In this case, the bounce flash should likely be used in a manual mode using a non-dedcated hot shoe.